Prototype: German Railroad, Inc. (DB AG) class 218 diesel locomotive. “Tourism Train” paint scheme. Diesel hydraulic locomotive with electric train heating. Road number 218 416-6 . The locomotive looks as it did around 1995. Model: The locomotive has an mfx+ digital decoder and extensive sound functions. It also has controlled, high-efficiency propulsion. All axles powered. Traction tires. The triple headlights and dual red marker lights change over with the direction of travel, will work in conventional opera - tion, and can be controlled digitally. The headlights at Locomotive End 2 and 1 can be turned off separately in digital operation. The cab lighting changes over with the direction of travel and can be controlled digitally. Maintenance-free warm white and red LEDs are used for the lighting. The locomotive has separately applied metal grab irons on the sides and ends. The buffer beams are detailed. There is a figure of a locomotive engineer in Cab 1. Length over the buffers 18.9 cm / 7-7/16“. In the mid-Nineties, the DB AG attempted to lure more vacationers to the rails with a pilot project. On October 2, 1995, it thus presented the first of two newly created tourism trains in Berlin. These trains were painted in the characteristic colors of a stylized “sea, landscape, and sky”. 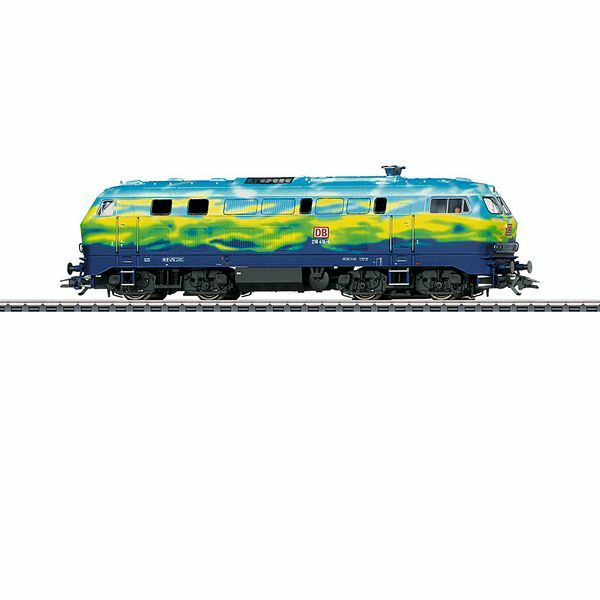 The extremely colorful paint scheme in sap- phire blue, leaf green, traffic yellow, sky blue, and white adorned in waves and cloud forms both the three locomotives planned for this service in (103 222, 218 416 and 418) and also the cars. The central pillar of this new offering was formed by its own pool of rolling stock and motive power, with which the railroad tried to score with a modern design and corresponding comfort. With only about 50 seats per car, there was a third more space than in nor - mal trains. A club car with a bar and armchairs as well as a dining car provided additional freedom of movement. Children traveling with their parents found supervised play options during the trip in a car with the name “Eltern for Family Kinderland” (“Parents for Family Kiddy Land”). Overflowing baggage and bicycles could be put into a baggage car. Initially, there were prominent operations as “UrlaubsExpress (UEx) Mecklenburg-Vorpommern” (“ Vacation Express (UEx) between Düsseldorf and Wolgast Harbor with through cars to Bergen on Rügen. In the summer of 2000 this pair of tourism trains then ran Saturdays on the routing Cologne – Zinnowitz (on Usedom), whereby a side through car operation connected Cologne with Binz on Rügen. Naturally, these special units were basically designed as charter trains, which could also be leased by tourism firms, travel agencies, or other operators.